Album Review: Corigliano’s Conjurer and Vocalise – where are we now? John Corigliano is consistently one of the best American composers alive. Ever since listening to his Symphony No. 1 in college I’ve been hooked on his music. This album of his music with the Albany Symphony under David Alan Miller is no exception. The first piece, Conjurer, is Corigliano’s first percussion concerto, featuring Dame Evelyn Glennie as the soloist. The piece addresses Corigliano’s concerns with the run-of-the-mill concerti where the soloist is just a glorified drumset accompanying the orchestra—so he takes care to have the themes emerge from the soloist. There are some raucous passages and some very cool timbres. I like the idea of using a non-pitched keyboard of woodblocks to augment the marimba sound, and there are some strange glisses Glennie gets out of a “talking drum”. The middle section entitled “Metal” is a little long, but I was okay with it because I was preparing for the craziness to come in the final movement. I knew Corigliano wouldn’t leave me hanging. I was very scared to listen to Vocalise. In my experience, vocalises have almost-exclusively been navel-gazing student works. Add to that my PTSD from studying Babbitt’s Philomel in college, a harshly modernist work for vocalist and electronics, suffice it to say I was reticent. What I got was an entirely different experience. While I was expecting electronic augmentation the whole time, instead it was tastefully folded into the sound of the whole orchestra. If you’re scared of electronic stuff, you emphatically should not be with this piece. The lack of text is a little weird for a 20 minute work, but the piece blossoms with moments that almost sound like Tchaikovsky. 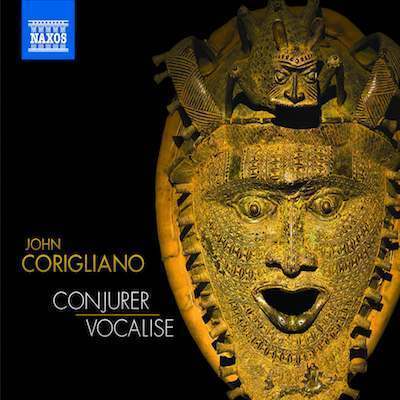 John Corigliano consistently creates accessible music that still manages to have wild gestures throughout. I highly recommend this album if you are a percussionist or if you’re trying to ease your way into listening to electronic music. Cool stuff.